I get it. My regular readers may note that—in addition to my contributions to this blog and other writings—I am a musician. No one tells me what to write, say, or sing. And the songs I write articulate my philosophies and beliefs. Sometimes people disagree with those philosophies and beliefs. Fair enough. Bruce Springsteen has come out with a new album. He spent much of the last few years campaigning for Democrat candidates and at the behest of MoveOn.org (the left-iest of the leftist left). So far so good. His new album professes his anti-war sentiment. Well, that’s not really fair. I know of no one who is “pro-war,” per se. But it is pretty clear that Bruce does not think that we should be in this war…or the one just before this one…or the one before that, come to think of it. Anyway—Bruce wants us out of Iraq. Again, we can agree and/or disagree—no problem. His art, his message. It is one thing for the expression or performance of art to inspire outrage, discussion, or thought; and it is quite another to beat the drum of controversy first, in a craven attempt to generate sales. This is especially true when you are using our national divisions and the blood of soldiers to do so. The new Springsteen album, titled “Magic” and released last week, has been getting a lot of press. Some of that press has been complimentary of the music itself, but most has been “controversy spin.” The Guardian’s recent article “Springsteen ready for criticism over ‘Magic’ words” is one such example. Note that there is, at this point, no criticism—but darn it, as the article title suggests, Bruce is ready for it. And the article takes a swipe at talk radio as well, quoting Joe Levy of Rolling Stone, ”Springsteen will likely be grist for the mill among conservative radio and talk show hosts who will likely rail against the record and its message.” “Likely,” eh? One cannot help but detect a bit of hope in Mr. Levy’s comments and Bruce’s “readiness” that a few talk show hosts and other folks will actually talk about the album. All of this seemingly coordinated messaging smacks of a focused PR effort to not only “get in front” of the issue, but to literally drive the message and generate the hype. Real controversies generate themselves without artificial prodding. True art inspires its own discussions. Good music sells in spite of controversy, not because of it. 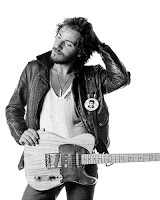 Remember—no one has yet criticized Bruce Springsteen or his message that I am aware of. And if there is any criticism, those authors have a right to their say as well. Freedom works. PR and advertising people do their job, and band’s and record companies sell music for profit. Some record labels use Night-club frolics, love affairs, faux grudges, and rehab clinics to gin-up the publicity that their stars need when albums are released. We all cringe at such ploys and shrug our shoulders in dejected acceptance that this comes with the territory. The Springsteen team appears to be using their political media connections to do so. Hey—freedom of speech, I really get that, too. But as the fans are cheering “The Boss” and holding up signs at concerts saying things like “No Blood for Oil” they would do well to remember that this is a “profit” deal. Each attendee will have paid upwards of $79.00 per seat for the concert tickets, the album sells for $9.97 at Amazon.com, and you can download individual tracks off the album for $.99 each from Itunes. I want all musicians to get paid for their performances and their product. I do not begrudge them that. And it is certainly not necessary that they agree with me on any counts at all. If any individual or group should attempt to silence a musician, I stand at the ready to defend them. But it is this writer’s (and musician’s) opinion that the intentional conjuring of pseudo-controversy on an issue that indeed is tinted by the blood of soldiers and patriots crosses a line. The Springsteen publicity machine should not be silenced, but perhaps they should be a bit ashamed.